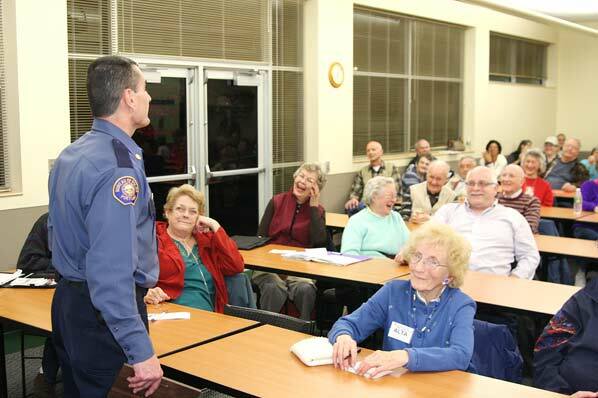 Portland Police Bureau East Precinct Commander Michael Crebs conducts his last “Commander’s Forum” meeting in outer East Portland. 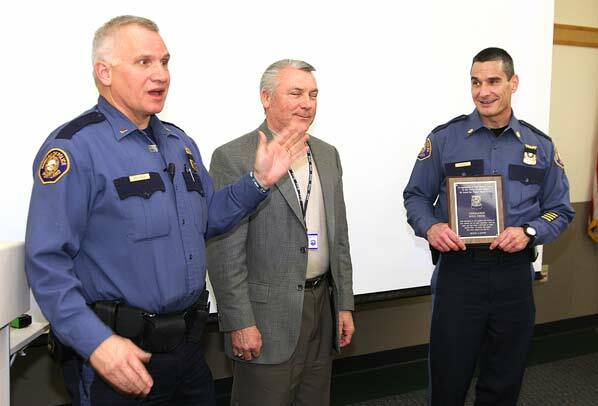 Having served four years and three months as Portland Police Bureau (PPB) East Precinct Commander, Michael Crebs announced he was leaving the post late in November. 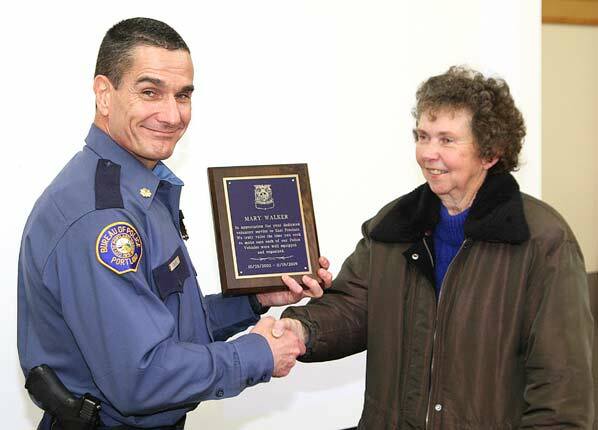 When past East Precinct commanders retired or were transferred, outer East Portland folks bid them a fond farewell. 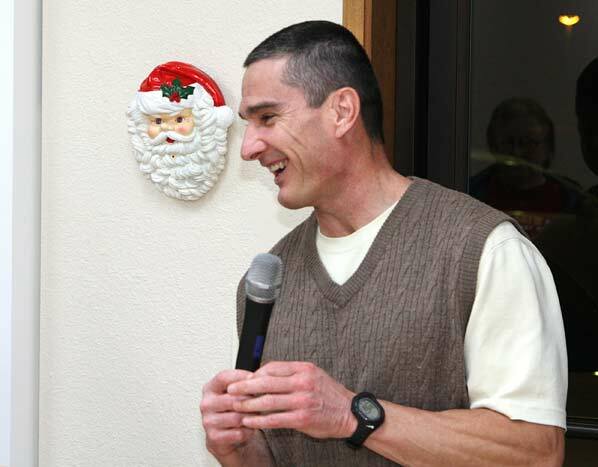 But, Crebs apparent concern for our area touched many people to the extent that he received two sendoffs in December. 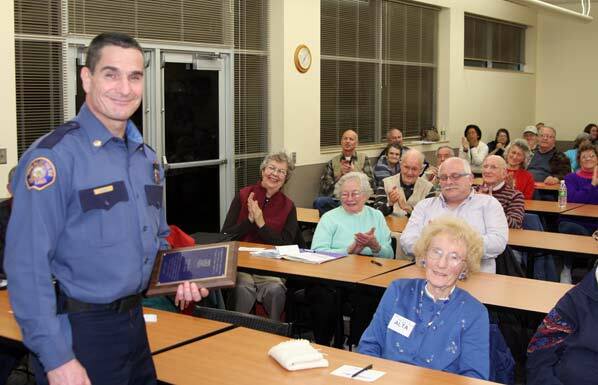 At the December 1 East Precinct Citizens Advisory Committee – still referred to as the “Commander’s Forum” by most people – the large Precinct Community Room was packed to overflowing with neighborhood representatives wanting to express their appreciation for Crebs’ dedicated service. But, Crebs didn’t speak about his impending departure. Instead, he called up Mary Walker, a resident of the Centennial Neighborhood, who was retiring from being a volunteer “Trunk Lady” (the Trunk Technicians restock the supplies carried in patrol vehicles) for the Precinct. Crebs smiled when David Smith, coordinator of EPIC – East Precinct Involved Citizens – strode up to the front of the room with a package in hand. David Smith presents a commemorative plaque to the departing Commander Crebs. The departing Commander appeared to be moved both by the plaque presentation and by the thunderous and sustained applause he received. 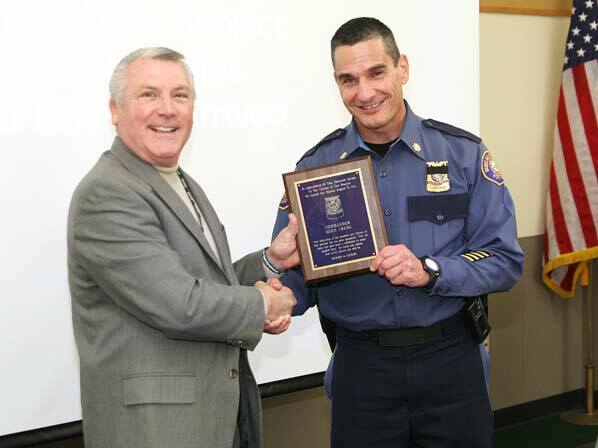 PPB East Precinct Lt. Tom McGranahan tells why the plaque is being given to the Commander at this meeting. Commander Crebs thanks neighbors for their support, and tells them he’s not retiring, but is being transferred downtown. 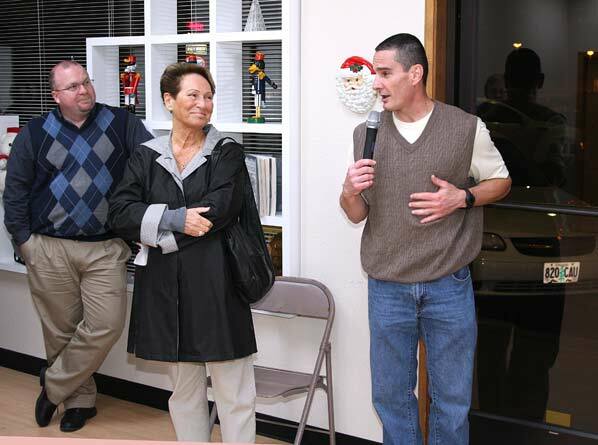 Commander Mike Crebs thanks business people at a GABA-sponsored Holiday party for supporting his work in outer East Portland. 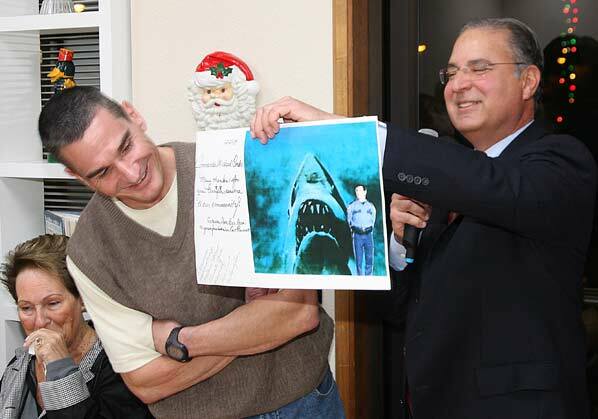 On December 21, under the auspices of the Gateway Area Business Association, the Sanchez family hosted a holiday-themed sendoff party for Commander Crebs at 111th Square. The handful of people present at the event, when we arrived at the decorated office, swelled to more than fifty well-wishers, as businesspeople arrived at the after-work event. 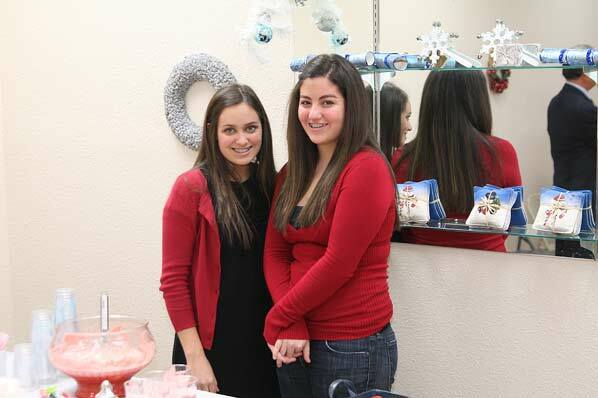 Nicole and Isabel Panichello (daughters of long-time Gateway supporter David Panichello of Opti-Con, Inc.) serves punch and treats to arriving guests. As the revelers filed in, Commander Mike Crebs, now with the Portland Police Bureau Detective Division, talked with East Portland News about his time in East Precinct and his new assignment. 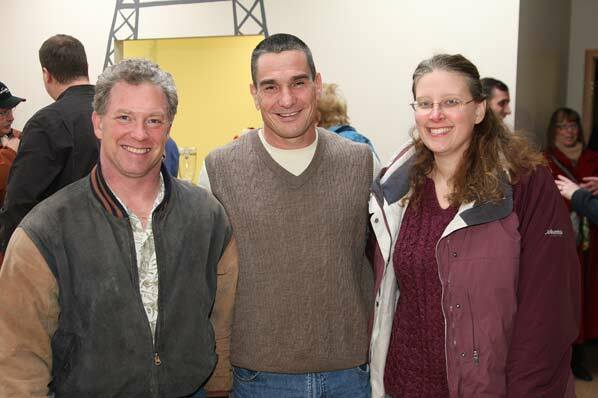 Mike Crebs shares a light moment with folks at the GABA gathering. He continued, “Honestly, I didn’t know much about outer East Portland before I took the East Precinct post. I’ve found that citizens here are very active and concerned about their neighborhoods. And they’re very energized toward making improvements here. Tom Barnes of the Powellhurst-Gilbert Neighborhood Association, and the VP of the Midway Business Association, Donna Dionne from Love Boutique, spend a moment with Commander Crebs, to wish him well. From the southern neighborhoods in the precinct, supporters Tom Barnes and Donna Dionne came to wish Crebs well. Fred Sanchez, president of Realty Brokers and host at 111th Square, reveals what he believes is the featured entree on Commander Crebs’ secret diet. (Actually, it’s tuna!). 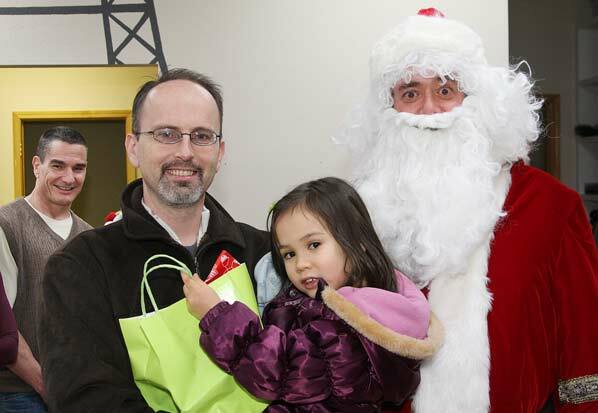 Commander Crebs looks on as Montavilla Neighborhood Association Chair Brian Wong and Samantha visits “Not your ordinary Santa” Kevin Minkoff, CPA at the Gateway gathering.